Showing items in category Brunei, sorted by newest listed first. BRUNEI - 1962 use of unaddressed FIELD POST OFFICE/1044 cover. 1962 (DE.8.) 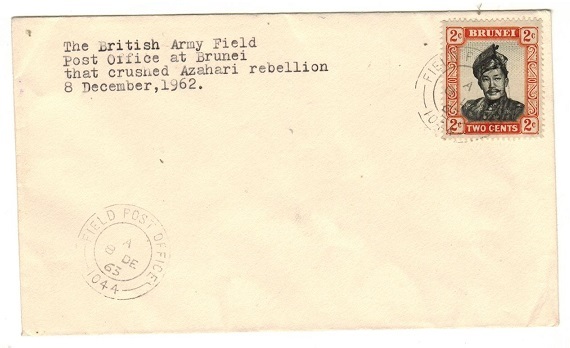 unaddressed cover bearing 2c adhesive tied FIELD POST OFFICE/1044 and marked 'The British Army Field Post Office at Brunei that crushed Azahari Rebellion'. 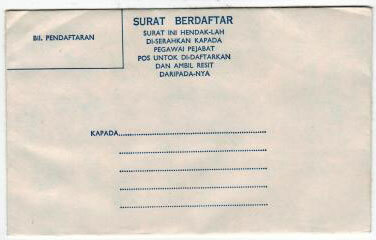 BRUNEI - 1971 15c rate on FORMULA air letter to Singapore used at BANDAR SERI BEGAWAN. 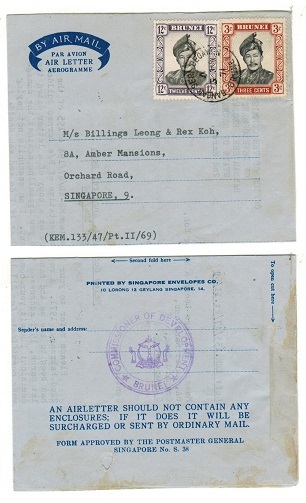 1971 use of dark blue on blue AIR LETTER addressed to Singapore (genuine use) bearing 3c and 12c adhesives tied BANDAR SERI BEGAWAN/BRUNEI cds. Violet circular COMMISSIONER OF DEVELOPMENT/BRUNEI cachet on reverse side. 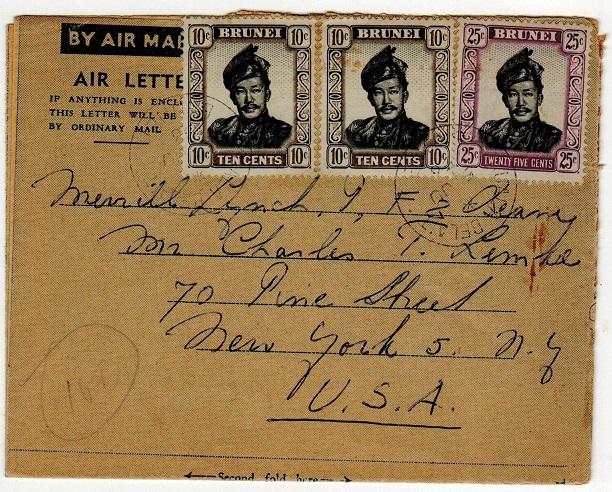 BRUNEI - 1935 12c rate cover to USA used at BRUNEI. 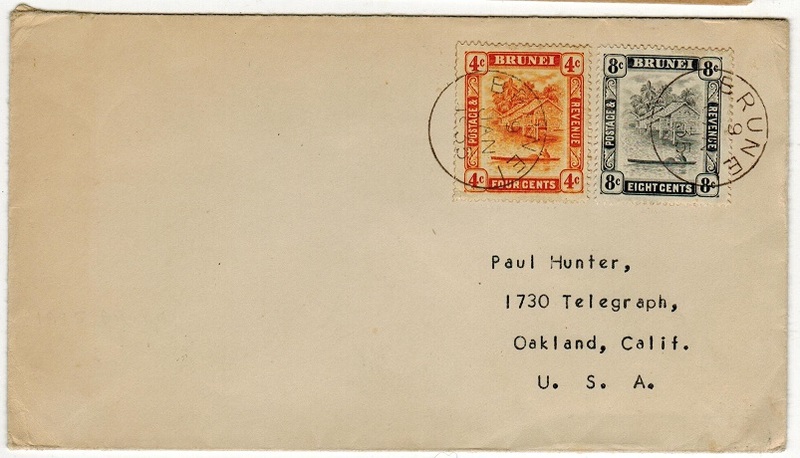 1935 (JAN.9) cover to USA bearing 4c & 8c adhesives (SG 65+72) tied superb BRUNEI cds's. BRUNEI - 1907-08 3c grey-black and chocolate fine mint with WATERMARK REVERSED. SG 25x. 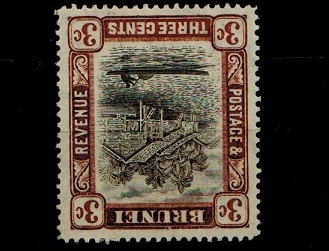 1907-08 3c grey-black and chocolate adhesive in fine mint condition showing the variety WATERMARK REVERSED. SG 25x. 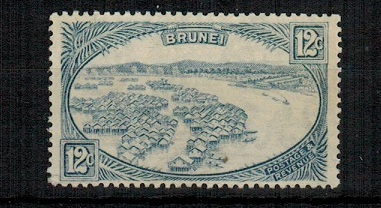 BRUNEI - 1924 12c 'Greenish Blue' U/M shade. B&K G28. 1924-37 12c 'GREENISH BLUE' adhesive in fine unmounted mint condition listed by Bridger and Kay catalogue (BK G28) but unlisted by SG. 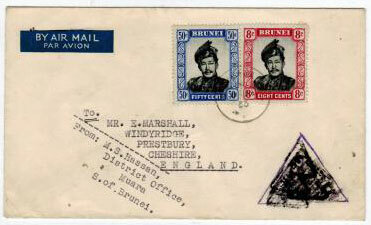 BRUNEI - 1945 'North Borneo/Sarawak' BMA combination cover cancelled by lino type strike. 1945 (DEC.17.) 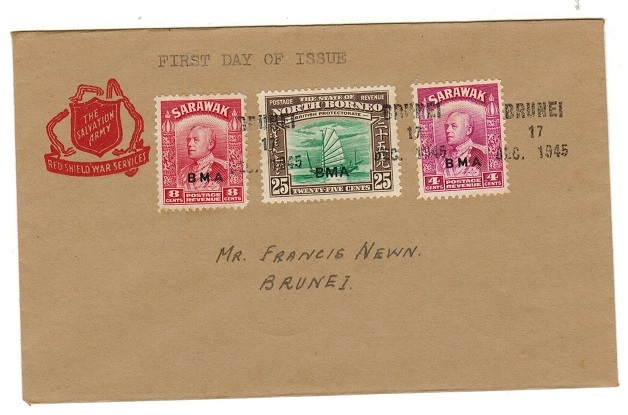 'The Salvation Army' monogrammed cover addressed locally bearing North Borneo 25c adhesive overprinted 'BMA' tied in combination with Sarawak 4c and 8c adhesives additionally overprinted 'BMA' and tied by lino type BRUNEI cancellation. The cover marked 'First Day Of Issue'. Proud type D11. 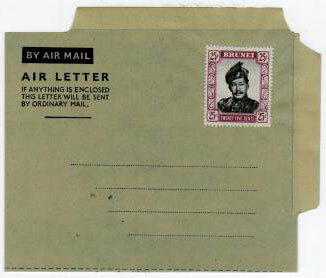 BRUNEI - 1956 FORMULA air letter to USA used at KUALA BELAIT. 1956 (JU.5.) genuine use of blue on yellow-cream FORMULA air letter addressed to USA bearing 10c (x2) and 25c adhesives tied by KUALA BELAIT/BRUNEI cds's. 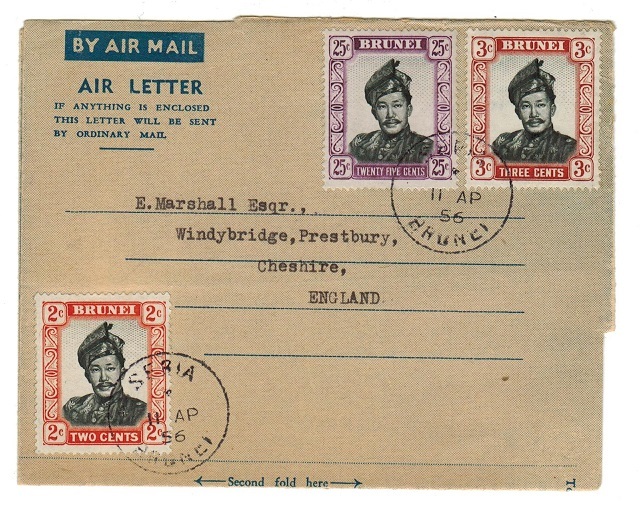 BRUNEI - 1956 FORMULA air letter to UK used at SERIA. 1956 use of blue on cream FORMULA postal stationery air letter (genuine use) addressed to UK and bearing 2c, 3c & 25c adhesives tied by SERIA/BRUNEI cds's dated 11.AP.56. Scarce. BRUNEI - 1922 'Exhibition' set of nine in fine mint condition. SG51-59. 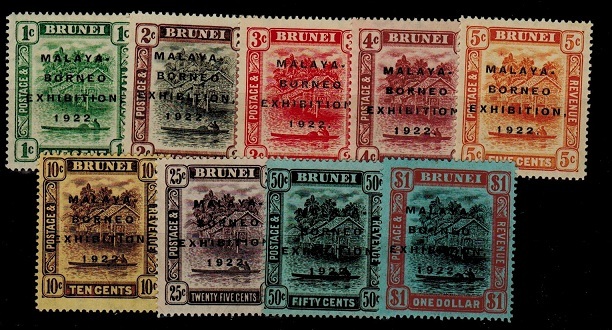 1922 'Malaya Borneo Exhibition' series of 9 values in very fine mint condition. (25c with SHORT I variety). SG51-59. Scarce set. BRUNEI - 1980 'No Value' RPSE unused. 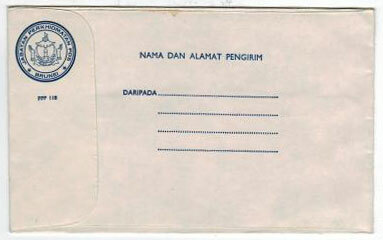 1980 'No Value' Blue on white 'PPP 118' registered postal stationery envelope in fine unused condition. (155x96mm). BRUNEI - 1953 taxed cover used from MUARA. 1953 (AU.6) cover to UK bearing 8c+50c adhesives tied MUARA & with violet triangular 'T' tax marking which was then subsequently deleted with the use of black triangles. BRUNEI - 1952 FORMULA air leter uprated with 25c adhesive. 1952 blue on grey FORMULA postal stationery air letter with 25c (SG 109) adhesive officially added in fine unused condition. Scarce. 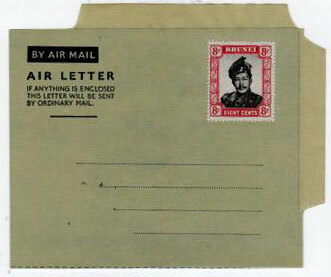 BRUNEI - 1952 FORMULA air letter uprated with 8c adhesive. 1952 blue on grey FORMULA postal stationery air letter with 8c (SG 105) adhesive officially added in fine unused condition. Scarce.